I've been on holiday for the past two weeks, swimming every day, and have noticeably lost weight. I'm tightening the side adjustors on my trousers where I didn't before. It reminds me how frequently readers ask about such fluctuations in weight, and how to deal with them when commissioning bespoke clothing. Such changes can be frustrating. I find it particularly annoying how it not just makes things loose or tight, but changes posture. If you gain weight on your stomach, for example, you naturally start to lean back, to adjust your centre of balance. This can lead to you pushing on the collar of a jacket, and creating wrinkles below it. Losing weight, meanwhile, can make you to stoop forward and have the collar stand away. Losing or gaining weight on the belly is the commonest problem for men, as it affects both the waist of the trousers (where you'll tend to notice it first) and the buttoning of the jacket. There's more tolerance for gaining muscle mass, perhaps on the upper body from gym work, as there is usually more room in the chest. However, extreme gains in muscle are a bigger long-term problem, as beyond a certain point they fundamentally change your neck and shoulders, which is much harder to adjust for. Taking the waist in by a couple of inches is easy by comparison. In terms of how to deal with weight changes, it certainly makes sense to go to the tailor or shirtmaker when you are at your average or normal weight. Not just after Christmas; not just after a marathon. I'm always surprised how many people I overhear in tailors saying that they expect to lose weight over the time in takes to make the suit. In that case, wait. Unless it's a wedding and you have a strict deadline, be patient. Start the bespoke process when you are at your normal, or new, weight. It also puzzles me when men say they are concerned that bespoke has little capacity to deal with changes in weight. The opposite is true. Most obviously, because bespoke suits will leave more inlay (extra cloth) at the seams than ready-to-wear RTW, to aid future alterations. Bespoke comes from a world where it is assumed you will have the suit for decades, and it has to change with you. With RTW, by contrast, every centimetre of inlay is wasted cloth, and therefore cost. 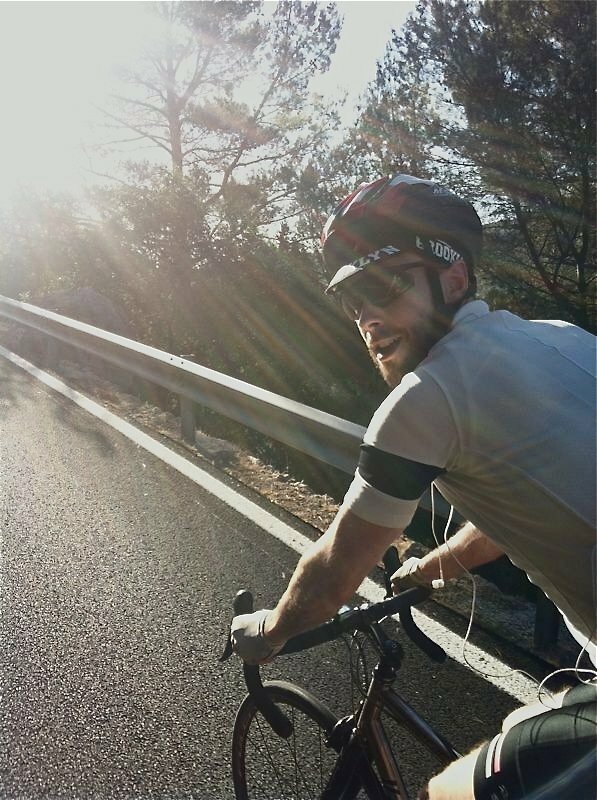 A less obvious point is that bespoke is more able to flatter you without being too tight. Because bespoke jackets are hand made (in particular, with a hand-padded chest), they can be shaped to flatter the body, with a chest that is slightly bigger than your own, perhaps a slightly extended shoulder, and shape through the waist that is gently and smoothly suppressed, rather than tight. 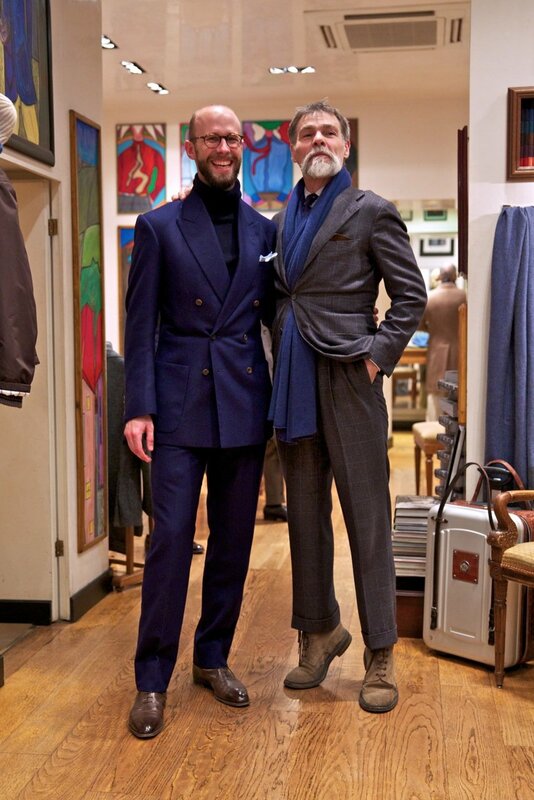 This is why some tailors will say that a bespoke jacket makes you look better than RTW, even if it isn't made for you. That three-dimensional shape is still flattering. Those new to bespoke also sometimes don't appreciate the difference between tightness in the back and in the front of the jacket. I helped a reader recently through his first bespoke experience, and he consistently wanted the jacket tighter. He was pulling at the waist button, seeing room to spare, and thinking this meant it was too loose. I asked the cutter to pin the jacket tighter, and showed the reader that it didn't actually make the waist look any slimmer from the front. The excess he was feeling was in the back of the jacket, and was needed to create a smooth and flattering line through the small of his back and over the seat. This can lead to a jacket being comfortable in the waist, while still having the trimmest possible silhouette. 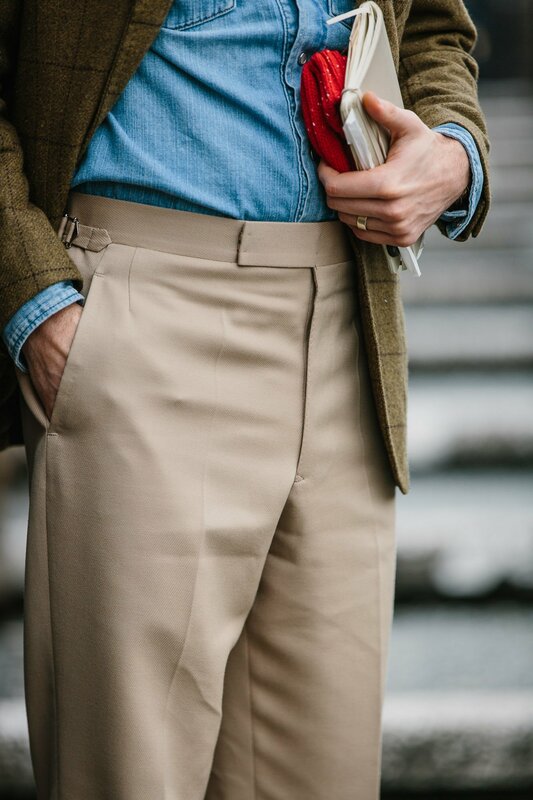 I suspect that when men say bespoke is less able to deal with changes in weight, it is because they tend to have any custom piece - bespoke or MTM - cut tight. I'd encourage them to have it slightly larger. It's more comfortable, retains its shape well when you move, and enables you to wear fine knitwear underneath. Of course, the other concern about fluctuating weight is that bespoke is expensive - and you don't want to waste that on something that doesn't fit for long. But by that same logic you would never spend significant amounts on clothing - not just bespoke. And bespoke has that little bit more adaptability. Some also say that investing in quality clothing is the best possible motivation to stay in shape. I've always done a lot of exercise. I was a distance runner when I was young and have always played a variety of sports. This helps keep me in shape, but also means that I fluctuate quickly when I'm ill, travelling, or for any other reason can't exercise. Unless I significantly cut down on what I eat, I get fat fast. Bespoke has always been able to adapt. I'm not quite as skinny as I was (the five suits/jackets I had made at Anderson & Sheppard about eight years ago - one below - have all been let out once) but I've averaged around the same weight for the past five years. I'm sure I'll put on weight when I get back home and starting working full-time again. If I don't, the jackets will still look good and the trousers have side adjustors. You can follow the discussion on Dealing with losing and gaining weight by entering your email address in the box below. You will then receive an email every time a new comment is added. These will also contain a link to a page where you can stop the alerts, and remove all of your related data from the site. Dear Simon. It has also been my experience that, unless the difference is extreme, bespoken can be very easily adapted to changes in the body. I am still able to use my suits from when I was spending 10 hours per week at the gym 20+ years ago. On the other hand, I do not share your experience of gaining weight when stopping exercise. For me the opposite is true as 1) you are less hungry with less activity and 2) you will lose muscle mass quickly. In theory there is no metabolic reason to gain fat, specially that fast. I know what you are saying is “common wisdom” but, if that is the case, then it is diet and not age or activity related. Do you know Dr Aseem Malhotra? Thanks. The latter point is more personal, perhaps. I find it hard to adjust my eating patterns for short periods when I’m not exercising. That is more or less my point: You should not need to adjust anything if you change your level of activity. Your body naturally copes with these changes. If this is not the case, then eating patterns while exercising are to blame. I will not further comment on this as I understand that I may already be overstepping personal boundaries. Interested to know to what extent men’s bodies and feet typically change with age. Presumably tailors and shoemakers have a usefully large sample of sizing data to observe trends. Typo alert with potentially dangerous consequences in the last sentence there. As for feet, they tend to become flatter as they age, and the small toe tends to curl in sideways (we get that from wearing closed shoes). Good posture and being fit through life certianly helps maintain, as Will Boehlke used to write, the same body size a man would retain when he reached adulthood. Hi, I have had many a bespoke suit made in the past from a variety of the Savile Row elite houses. Sadly due to age as im sure you know full well Simon, you start to let yourself go a touch around the midriff. What would you advise me to do? I am more than happy to foot the bill to have them let out where necessary however, would you advise me to sit tight and see if I could shed some of that puppy fat or go ahead and get them altered and if needs be take them back for a set of re alts when due? I think it’s your call Hugh – depends how likely you think the weight is to come off. Perhaps give yourself a deadline, say 3 months, to see if anything changes. Thanks for the reply. I certainly hope that within 3 months I wont be as overweight as I am now, but with all the stress from work and the divorce im going through its very hard to say. I take great pride in my appearance and I dont like looking like im wearing suits that are overly tight, as you mentioned above about first time buyers having them tailored within an inch of there lives, I dont want to look like a novice! Hugh, exercise is the absolutely best way to deal with stress. I recall the eyebrows raised by my tailor when I responded in the negative to his question about losing weight when commissioning my wedding suit. I wasn’t going to have the time to exercise more than my usual regime and have found crash dieting totally counter-productive, so why kid myself and make the cutters’ lives harder in doing so? I’ve always felt one of the appeals of bespoke to be the lack of a need to compromise on fit compared to RTW clothing, which for the most part falls prey to fashion’s obsession with extremes, whether that’s the excessively slim tailoring that has been the norm for the better part of a decade, or the current shift back to wildly over-sized silhouettes. RTW is cut for the David Beckham body type. As for slim tailoring , blame the blasted Continentals and Hedi Slimane. That man should be burnt at the stake for the damage he’s done to menswear. Thank you for taking the time to listen to my waffle in Drakes yesterday! As Ben mentioned yesterday you really have to have some extreme changes in weight/shape to force a re-make of /a jacket for example wouldn’t you say? Also some fabrics would be more forgiving than others? By the way did you pick up anything interesting? Aha! Great to put a name to a face – I didn’t realise you were ‘Mac’. I got one of the towelling polos, yes. Surprised how much I liked them – I think it’s the thinness of the towelling, which feels almost just like textured pique. Very different from other towelling I’ve tried. And yes, I agree that you’d have to have extreme changes (such as a lot of bodybuilding) to require a jacket to be re-made. Some fabrics will be more forgiving, basically anything wool, loosely woven. But it’s a small difference. 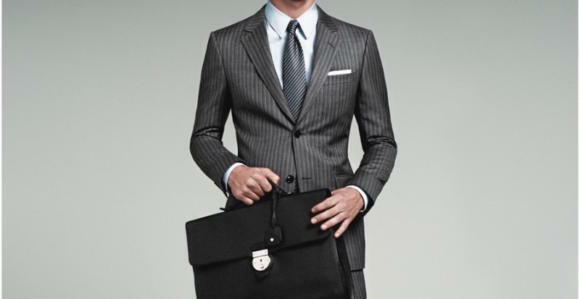 Hi Simon, possibly a stupid question, but that’s concerning fit and that nice feeling of comfort in the waist: would you consider the grey suit in the image with the bag being too tight, or is the wrinkling just a natural consequence of the posture/movement of the model? Simon, many thanks for a topical blog post. I have suits acquired 20 years ago in my wardrobe which are a couple of inches too small in the waist (and too baggy in style to wear even if they weren’t!). I have followed your excellent advice on alteration tailors and recently had two RTW suits altered to great effect, really proving the value and benefit of getting alterations to perfect fit. Hi Simon fantastic article as always. just wondering how tall you where? also having done a fair amount of weight lifting myself I can vouch for the fact it is extremely hard to bulk yourself out of a jacket. I always presumed the line through the neck to the sleeve head whould cause the most issue, but the deltoids have very limited natural growth really, for some trapezius could pose more of a problem but again extreme natural growth that would be enough to require the jacket to be remade is very rare. Hello, thank you for the blog! What is the brand of the notebook in the first picture? Hi Simon do you use moleskines regularly? I used to love them but a few years ago I switched over to leuchtturm notebooks the little details like the additional bookmark, numbered pages and archival stickers that i can imagine a man like you would appreciate, meant i never went back. do say if you have already or do end up giving them a try. Definitely agreed on getting things made a touch larger vs a touch too small – no matter how hard I try, I always seem to add a bit of “winter insulation” during the colder months, which I then lose in the summer. It’s for this reason I’ve finally come to conclusion that side adjusters are simply not enough to stand in for a belt or braces. After many failed attempts I now only use them for suit trousers that also have braces, and stick with belt loops for everything else. Great article, thank you for addressing something that most men will have to deal with in time. Over the years I have used two strategies to deal with the issue. Firstly I usually have approx. 40% of my wardrobe sized slightly larger for winter wear as I usually wear a T under shirts in colder weather, this means shirts and trousers are usually a little looser with the converse for summer’s lighter wear. This looseness of fit also helps with ‘winter weight gain’ wherein weather related carbohydrate intake is higher. Secondly, over the long run, the most vital thing is to manage weight – this is particulary so for fit or active men who slip into a more sedate middle or older age. A few years ago, after slight weight gain, I was upset at suits not fitting properly. Yes, they can be adjusted, but the real answer, particularly for long term helath is to manage and alter diet to a healthier level (the reduction/removal of sugar, alcohol, fatty foods, high caffeine has the best effect). Fitness, shape and health improves and suits, thankfully, fit in the way they once did. Not always easy but worth the committment. 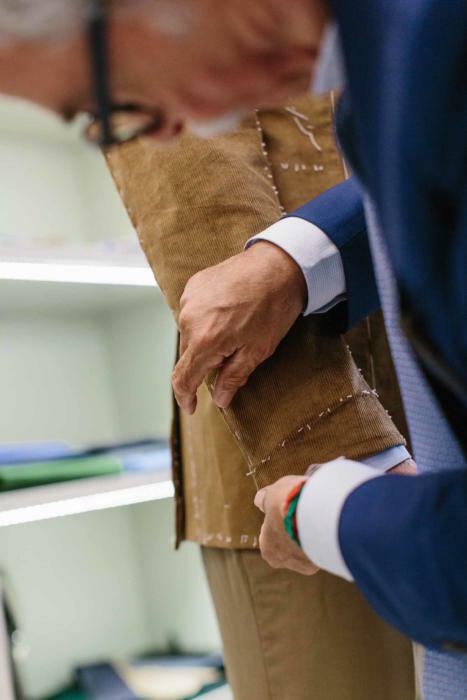 Would you expect a top-range tailor (like Savile row) to do changes like these for free – as a kind of ”after-service” – or is that expecting too much? If you have an ongoing commission, most tailors – even in these straitened times – will alter previous commissions free of charge. Otherwise it’s very much up to the individual tailor. This is one example of the advantage of bespoke. 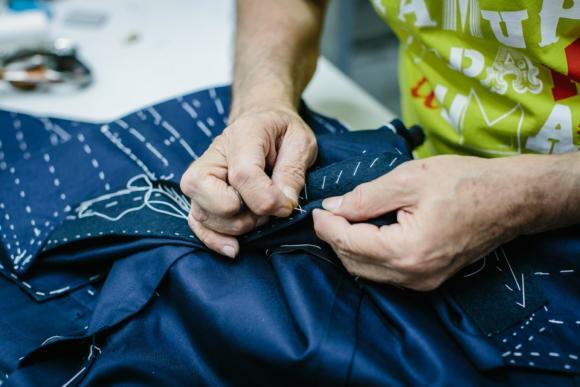 The vast majority of RTW outlets will charge for alterations. Which could mean adding anything up to 50% to the initial cost of the item. Very useful post)). I am in bespoke experience for 15 years now. Since tthat time I was +-15 kg. For example than we occasionally meet with Simon at the streets of Firenze in January I was 13 kg more than now. So I have bespoke wardrobe for any changes of weight but still I every year I return my things to sartoria for service and correction (if needed). This is a really useful article . I find the problem is the waist on trousers (jackets can always be left unbuttoned ). And with this in mind ,Simon, we need a really clear and CONCISE article on trouser waist with really good pictures . Too often I’ve had the leg altered when what was needed was the waist ! Men continually don’t know EXACTLY where trousers should sit and then any weight gain exaggerates the problem . Even alteration Tailors don’t get it !! The results are often unbuttoned trousers held by a belt or a belt hidden by the overhang of belly. In addition a real pearl of wisdom …..
“The excess he was feeling was in the back of the jacket, and was needed to create a smooth and flattering line through the small of his back and over the seat.”…. An article with illustrations on the above point would be fantastic to educate men. P.S. You went on holiday and lost weight !!! When you say an article on trouser waists, you mean where the trouser should sit? This is quite hard to illustrate without images from several types of people, but I’ve generally found is quite simple: either you have them on the hips, sitting in the middle of the curve of the hip bone, or way up, on your natural waist (between the top of the hip bones and the bottom of the ribs). Variations beyond that are just about balance back to front. Hi Simon, I hope you had a lovely holiday. How many swim shorts (assuming they were OB) did you rotate in for the 2 weeks? Funnit thing. I don’t visit you website that often – not because I don’t like you work, it’s because my body isn’t ready for the more dressed part in my wardrobe yet. I do a lot of weight training (cardio included) and I was wearing the jacket size 48 a few years ago. I’ve gained around 12-15 kilo since. My work and life style does’nt require more dressed up clothing – even though I like it. Therefore I decided to wait until my body shape and weight remained even for at least a year. Well… This leaves me with a great clothing interest and not even a suit or a blazer in my wardrobe. I don’t see it as a problem, it’s a journey. And as for more dressed occasions I wear flannel pants, shirt and a pullover. It works just fine! This leads my interest to work- and military style. Things that are great is a special interest! I really appreciate your series about this – things that age well. This is how I handle my interest today. Vintage Levi’s, US military wear, good re-productions of leather jackets, glasses and shoes of course . The fit works even if you ad or loose a few pounds. Overall, my key is to wait and during the time plan what I want and how I want I. One thing is for sure… My taste has grown over the years and I know what I want to spend my money on when time has come. And as a bonus… Most staples in my wardrobe as for today can be combined with more dressed clothing. Keep up you work Simon. It’s great! This is a topic that takes a lot of my thought, strongly reinforced by my career in health care. My weight used to swing a lot, easily by 15 or 20 pounds, and I always leaned on exercise as my way of bringing my weight into an ideal range. But when my exercise routine would be thrown off by a move or some other change, I realized I was a slave to the exercise regimen, as much as I love to be active and prefer to keep it in my life. I realized I was never going to get a handle on my weight until I got a handle on what I was eating. And I love to eat and can get fat fast, just as your described. This was a huge eye opener regarding my diet, but has meant that I have maintained my weight within 5 pounds over the past 13 years, adjusting my food intake as I exercise more or less. But it takes consistent effort to keep this balance, since I love food, have a cooking hobby, and the obesity trends of the modern world only make it harder. Thankfully, my interest in fine clothing only reinforces these efforts, just as you wrote above. As a longtime reader, I really enjoy your thoughtful and personal writing! I’ve found its not so easy to cover up weight or muscle gain in lighter weight cloths. I have about a dozen bespoke suits in varying cloth weights for different times of the year. The heavier weighted cloths seem to be much more forgiving, the lighter ones often emphasising with a new crease or two where your body has changed. In 15lbs, I have a killer wardrobe. That is me! LOL! Anyway, my tailor (Mahon) is really nice about it. I’m in the weight gain/loss cycle and just attribute it to the season. i have the solution. Very obviously braces solve this issue of high maintenance tailoring. I have always been against belts and a side adjuster man. But after a cancer battle and significant weight loss, I realized braces were the only solution. I had buttons sewn into all my trouser waistbands. I likely possess the worlds most extensive wardrobe and therefore it would have taken a year and constant tailor visits to correct a problem that would likely go the other way once I could eat again. I’m a complete convert to braces for trousers of all species. Braces allow a man to live as a man with minimal fuss. Lucky you who can choose where to get your clothes from. Once you get into weightlifting and bodybuilding, MTM or bespoke will become your only options since nothing “off the rack” will fit you properly. The last time I was able to buy a RTW shirt without having to bring it to a tailor to have it adjusted was in 2014 and I would like to add that it was an outdoor shirt by Fjallraven.